For the past few weeks I have been feeling overwhelmed with all I do. I’m not trying to puff myself up here, but I work hard at my day job, and my husband calls me a volunteeraholic for how I choose to spend my free time. But I’ve been thinking I need to dial it back and refocus on what’s important: God, husband, family, friends, work…. In that order. More than one of areas is not getting the attention it deserves, and I’m not feeling much peace in my daily life because of it. When I was in grad school, the pastor of my church in Florida preached a series called “iFamily” about the purposes and benefits of each stage of life. The “i am single” sermon talked about the benefits of being an unmarried member of the Church: flexibility when called to make a change, ability to focus or dedicate yourself wholeheartedly to a calling, capacity to interact with and serve others in ways married people can’t. Why? Single people have an abundance of unstructured, unfettered, unobstructed time. (Single parents had their own sermon.) Singles don’t have kids or a spouse to take care of. They don’t have in-laws to visit. They don’t have a spouse who expects to spend evenings with them. They don’t have to spend their weekends at Bed, Bath and Beyond, then maybe a trip to The Home Depot, you know, a nice little Saturday. They can grab a bite for dinner with co-workers if they want. They can volunteer for a worthy cause without having to consider how much time that leaves for their family. They can pack up and go for school, a new job, a mission, or just because they need a change. Singles have time and the freedom to spend it as they want. I’m in full agreement with the idea of living without complications and being free to worship God through a life to which He’s called you, but sitting there, single, with no prospects, and really wanting to be swept off my feet in a way that ended with a pretty diamond on my hand and a handsome, smart, loving fella in my heart, I guessed that my pastor had forgotten how long those single hours can feel. My time was already filled with uncomplicated pursuits I enjoyed and that I hoped pleased God: reading, serving others, fellowship with friends, building a career. But I didn’t feel at peace with lots of single time. I felt lonely. Now, as a newlywed, my friend’s observations about the scarcity of time in a marriage rang true: I don’t have a lot of free time. My husband quietly, lovingly, and fiercely demands my time. He wants to see me and be with me in the morning before we go to work. He’s in my texts and my inbox during the day. He wants to have dinner together, every night. He wants to visit his mom every Tuesday and for me to be there, too, because it’s his mom, and we’re family, and really: I want all of that, too. But I don’t feel at peace about this new allocation of my time. I miss my own routine and my own activities. Switching gears from single to married time. Romans 12:9-21 lays out 17 rules for living in peace with yourself and one another. Read the full NIV version here. Hate what is evil, cling to what is good. Hate those things that keep you from your spouse. I’m not suggesting you automatically hate your job or other obligations you keep to be a productive member of society, but cling to the time you have together. Keep praying that life will get better. Ask God for guidance about how to spend your finite time in a way that honors your goals, your spouse, and God at the center of you both. Pursue the Lord. Keep putting Him first. Everything else falls into place when He comes first. Be sincere. I choose my husband every day. Sometimes I choose to live out my time elsewhere, with other people, doing something not interesting to him but fascinating to me. (I like art. And museums. He stays away from both.) Everyone needs a break from each other, and when we are back together, it’s because we choose to be. Do the right thing, even for yourself. It’s astounding how I’ve transitioned from having so much time easily filled with satisfying activities to feeling like I don’t have enough time to satisfactorily participate in much outside of my marriage. Some days I’m angry that I agreed to give up my gift of time in exchange for a husband. (I just want a bubble bath with a good book and a glass of Pinot noir.) Other days I’m disappointed that I have to turn down an invitation to a party or a team because it will take too much time away from Jason. Still other days, I don’t care what’s going on outside our little family because I’m fully enjoying time with my husband and don’t want to be anywhere else. Mostly, I just want control of my time back, but I know that is a gift reserved for singles. Maybe the balance of time between marriage and everything else will swing back to external things as our marriage matures. Maybe it’s time to make peace with my time, and tell myself that it’s okay to let God direct my daily life. To cap off that last point, here I am stuck at home with a cold after a weekend where I ran 12 miles in training for a half and didn’t let myself rest enough afterward. I didn’t do the right thing for me. Now I am missing work, church, staying away from my husband for fear of getting him sick, and not able to keep training for my half marathon. I stayed home and while I did some work, I also napped, prayed, caught up with family via text and phone (from my bed)…. In short, I had the most peaceful day I’ve had in awhile. We don’t do everything together, and our marriage still works fine. 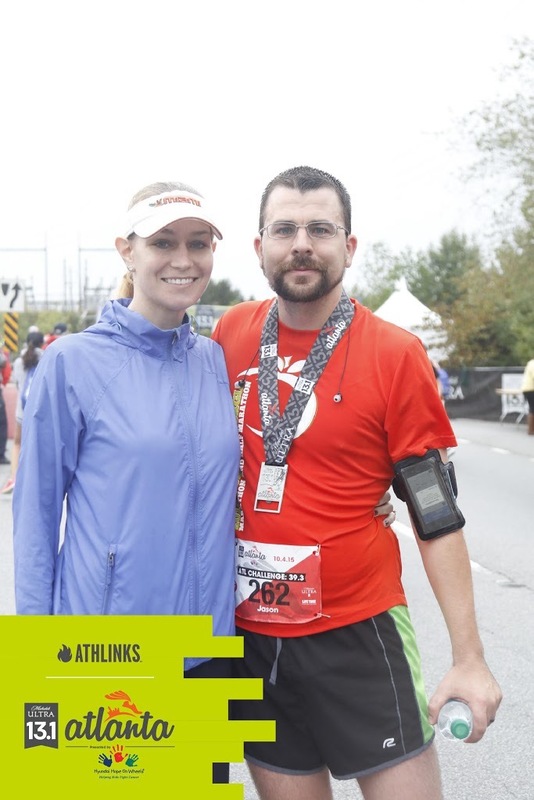 He ran the Michelob Ultra 13.1 while I stayed at the finish line handing out food and drink.